For Ira Sachs and Jennifer Ehle, moviemaking is less of a job than it is a way of life. Sachs' fascination with the film world began while attending Sundance Film Festival in his early teens. After college, he spent three months in Paris, where he saw three films a day — one hundred and ninety-seven films in total. 'E' is the most commonly-used letter in the English language, but you can never have too much of a good thing. In this game, contestants insert the letter 'E' into a common phrase to turn it into a completely different phrase. For example, if we said, "After an hour of Soulcycle, I learned a lot about the bones in my back," you would answer, "SPINE class." This week's Mystery Guest is Darren Wong, who is responsible for a hot new food trend. What's interesting about it is that his creation looks like something it's not. Can Ophira Eisenberg and Julian Velard figure out what his creation is, and what it looks like? No amount of experience makes an actor completely immune to stage fright. 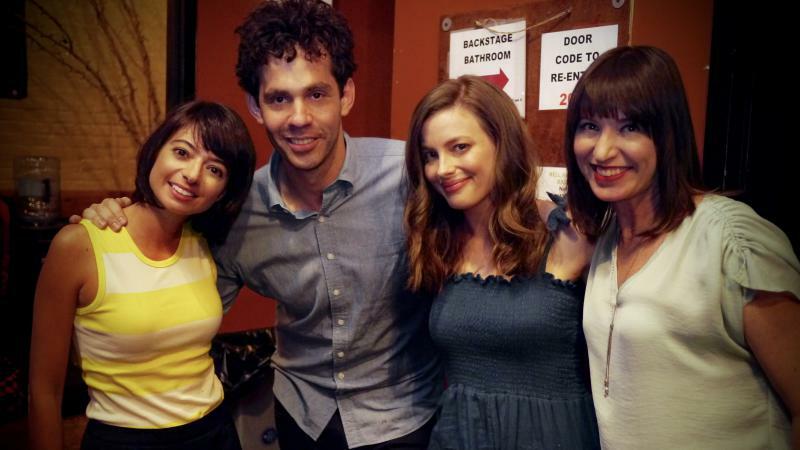 At least, that's what Gillian Jacobs and Kate Micucci say. Jacobs, who has been acting since she was very young, rose to fame when she landed the role of Britta in the acclaimed ensemble TV comedy Community. Since then, she has guest starred on Lena Dunham's Girls, and snagged a leading role in Judd Apatow's Netflix comedy series, Love. Every answer in this final round contains the letters "E-Z." So if we said, "An involuntary expulsion of air from your nose," you would answer, "sneeze." We've reworked The Beatles' hit "Come Together" to be about things that go together, like macaroni and cheese, or Bert and Ernie. Every answer in this final round is a two-word phrase or name in which each word starts with the letter M, like "Mickey Mouse." This game is about music sharing. Every answer in this quiz is the name of a song whose title is shared by more than one artist. For example, if we said, "This is a Marky Mark and the Funky Bunch song featuring Marky boxing and making out, and a memorable Beach Boys tune that features a theremin," you'd say "Good Vibrations." Contestants guess which U.S. state we're talking about based on a list of clues. Jell-O is the official snack of what state? Each of these answers contains the name of a flower or flowering plant. If we were to say, "British singer who recorded the albums "It's Not Me, It's You," and "Sheezus," you would reply, "Lily Allen." Contestants must mash up movie titles with the names of famous hip-hop and rap artists. For example, if we said, "Veteran cop Denzel Washington mentors Ethan Hawke about the album Three Feet High and Rising," you'd answer, "Training Day La Soul." We're closing this show like any good TV show or movie — with "An Emotional Ending." Every answer in this round contains a word that is also a feeling or emotion. If we said, "It's an app where avians are flung across the screen at piggies," you'd answer, "Angry Birds." This Is Our Administrative Assistant Day! Actor Jeff Goldblum is a busy guy. From hunting down dinosaurs in Jurassic Park to fighting aliens in Independence Day, he has done it all. But, as he tells host Ophira Eisenberg, these days he is learning the ropes of a completely new role-- father to his one-year-old son, Charlie Ocean, who was born, believe it or not, on July 4th. We've mashed up the names of famous people with common text messaging abbreviations. If we said, "You'll be 'Laughing Out Loud' when you hang out with this rapper and 'N-C-I-S Los Angeles' actor," you'd answer, "L-O-L-L Cool J."